Do you have a piece of clothing that undeniably hold sentimental value? Something that feels so 'you', that no matter how styled, confidence + comfort are effortlessly there. Honestly, that's me and my uniform skirt from my high school days. It's slightly embarrassing, but most likely due to the years of wear (in rain or shine) at my Northern California all-girls Catholic School. It reminds me of rebellion, when I would sneak and wear non-dress code pieces- Like a boys white tee instead of a polo, or a vintage sweatshirt over uniform sweater. I cannot say I was cool enough to rock Dr. Martens, but oddly I feel inspiration from this forever piece in my closet. 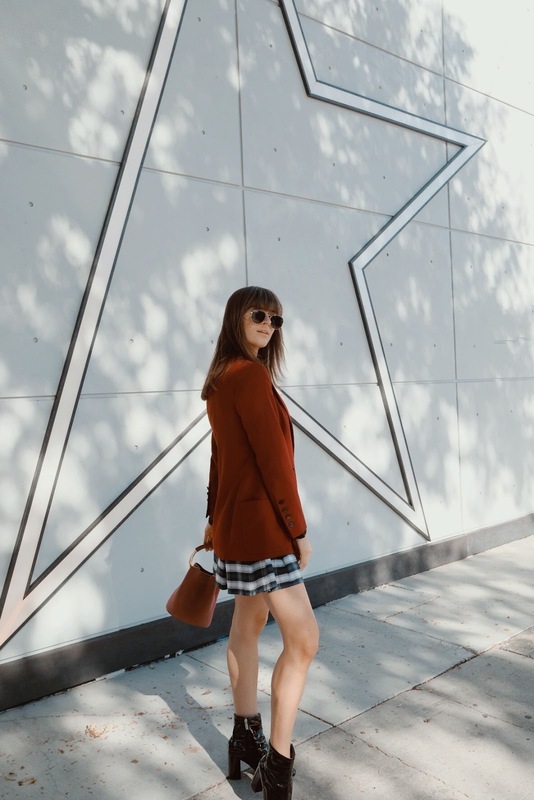 Plaid Uniform Skirt (Similar to here), Zara Maroon Blazer (Similar to here),Urban Outfitters Black Patent Leather Boots, Who What Wear Collection bucket bag (one of my other favorite designs).